← Gary’s Honda 90 Rides Again! I tested out my Wouxun KG-UV3D on APRS on Thursday, Sept 1st. The equipment went into my Blazer with a mag-mount antenna. As you can see from the following GPS track, the equipment performed well. This post describes my system, shows how well it works, and provides costs. Wouxun KG-UV3D-created APRS track points. The APRS points are the blue pins, superimposed on a previously-created GPS track. Note I get solid results, even in the deep canyons and up over the pass. Wouxun KG-UV3D as part of my APRS station. See text for description of each part. The Wouxun KG-UV3D dual band (2 mtrs, 70 cm) handheld, using its own battery pack. It’s obtainable from its U.S. importer, PowerWerx, and from many other sources. Note there are several models to choose from—be sure to get the one you want. Cost: $120. Be sure also to get the programming cable, cost $16. The programming software can be downloaded for free. I describe in a previous post how to use this software. Reverse antenna adapter for Wouxun, from SMA to BNC adapter (also can get their reverse adapter for SMA to PL-259). Note this is a unique style as the Wouxun radio uses the opposite type of adapter from everyone else. I really encourage you to get this adapter at the same time you get your radio as it will avoid lots of frustration further down the line. Cost: $6. Standard PL-259 to BNC adapter, used because my mag-mount antenna has PL-259. I have several of these in my junkbox. I searched in vain on the HRO website, but am guessing you can get one of these common items for less than $10. Note that if you get the reverse SMA to female SO-239 adapter, you don’t need the additional adapter. In addition, mag-mount antennas are available with various connectors. Mag-mount, dual-band antenna, that goes onto vehicle roof, held there magnetically. These are commonly available. One example is the MFJ-1412, which I think is the one I have, which retails for $30. 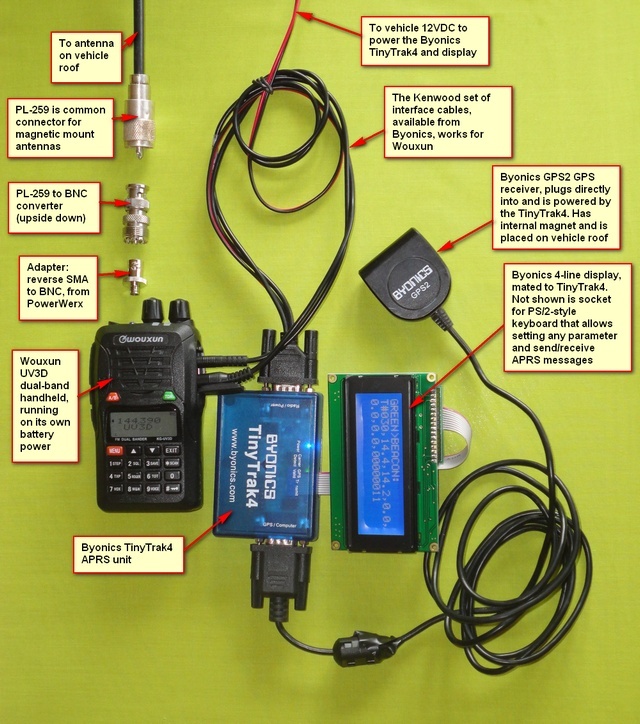 Byonics TinyTrak4, is the “smarts” for the APRS. As you can see, there are several ‘parts’ to this, and Byonics offers various combination offers. I purchased the TinyTrak4 already built in combination with the Byonics GPS2, which is on their website today for $140. Also, I purchased the TT4 Display with adapter, already built, for $40. Also, there’s the adapter cable which connects both to the radio and also to a 5 – 12 VDC power source. I got the one with the PowerPole connector, the HTKP, for $19. You’ll want to check out the Byonics web pages very carefully to ensure you have everything. I also purchased the TinyTrak4 Serial Splitter and Null Modem Adapter cable for $15 that allows connecting both to a computer using an RS-232 (hard to find on some modern computers) and to the GPS at the same time. This is one way to set all the parameters on the TinyTrak4. (Another way is to use a PS/2 keyboard and the interface unit—either works. But note it must be a keyboard with a native PS/2 connector, not a USB connector with PS/2 adapter, which does NOT work.) Let’s see, adding up all that Byonics stuff is $140 + $40 + $19 + $15 = $214. Note that the Byonics items can be used with multiple radios. And there you have it! A complete APRS tracker plus the ability to receive APRS information from other stations, plus exchange APRS messages. Total cost of such a setup, purchased new, is radio, $120, programming cable, $16, plus special reverse SMA adapter, $6, plus standard male BNC to female SO-239, around $10, plus mag-mount antenna, $30, plus all the Byonics items, $214. (I’m assuming you have an old PS/2 keyboard laying around somewhere.) So the total investment is just shy of $400, plus whatever tax and shipping you might incur. Plan for $450. Note: in comparing these costs against APRS-capable mobile radios, consider the entire system cost, including antenna, any adapters, programming cables, power cables, and so on. 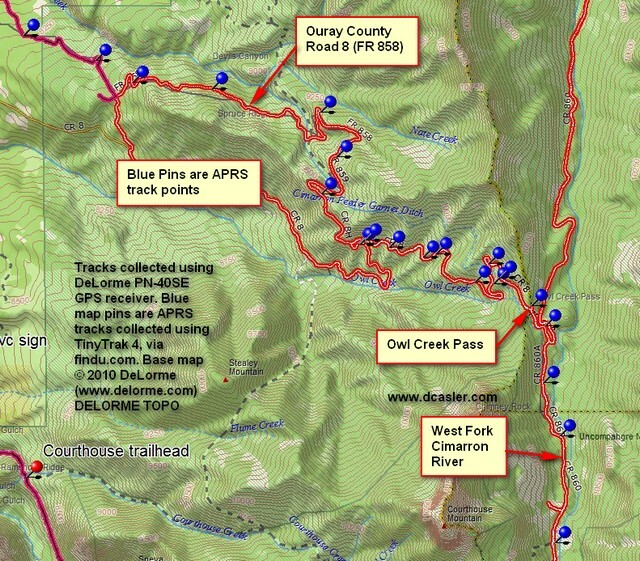 This entry was posted in GPS Tracks, Ham Radio blog entries, Ouray County, Product Reviews and tagged APRS, Byonics TinyTrak4, Wouxun KG-UV3D. Bookmark the permalink. 9 Responses to Wouxun KG-UV3D on APRS – Works Great! I have a weird problem with my KG-UV3D: I did everything “by the book”, as far as I can tell, but the CTCSS function fails to prevent signals without PL tone from opening up the squelch. I used MENU+ 15 & 16 as in the instructions. The HT does put out the correct PL tone alright, but any RFI nearby comes through while receiving. I just verified that by keying up and speaking into another radio with PL tone turned off. Anyone else have that problem? Use the Kenwood HT cable from Byonics. You can also get it from PowerWerx. As far as audio setup, just follow the TT4 instructions. I find that volume control at halfway works about right for receive. how do you set up the Wouxun HT to work with the TT4? Is there any way to capture the GPS data and send it to a smart phone app or tablet? Say we had a group of riders and a support vehicle and had a tablet mounted in the support vehicle. Could they see the riders positions and how could that be done? No. At least I don’t think so. The programming cable attaches between the Wouxun and the computer. The Kenwood interface cable attaches between the Wouxun and a TNC or APRS device. do you think that the programing cable for the Wouxun can do the same work that the Kenwood interface cable you are using ? But How do set up the TX sequence ? Thanks for this info! I suspected the Kenwood cables would work, but couldn’t find useful info about if they actually did. A little over $200 is a fine price for the APRS gear since I already have everything else.